More and more manufacturers are short-staffed, and that’s unlikely to change anytime soon. The industry is enjoying a period of modest growth; coupled with the fact employees are retiring faster than recruiters can replace them, and manufacturers are going to live with this reality for some time. Nearly half (45 percent) of manufacturers cite the inability to attract and retain workers as the biggest threat to their business. That threat isn’t off in the distant future – it’s already here. Three out of every ten manufacturers have turned down new business because they can barely handle the orders they have today. That’s more a people problem than it is a production problem; manufacturers’ inability to maintain and grow their workforces costs them opportunities and eats into their bottom lines. Manufacturers need to focus on their employer brands and, by extension, their employer value propositions. In the United States, there’s a considerable nostalgia for manufacturing as a profession; however, few want to do these jobs today, largely because they hold an image of manufacturing that’s extremely outdated. Modern manufacturers rely heavily on automation, and that’s created new job categories beyond the traditional blue-collar ones. While the public understands times have changed, the decline of manufacturing candidates from younger generations points to a serious perception problem. Compelling career portals and a social media strategy that highlight benefits, career opportunities and an engaging work culture go a long way, but the issue runs deeper still. 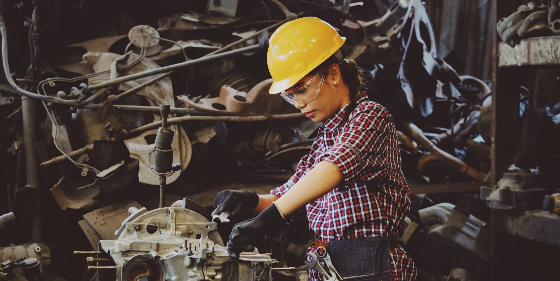 Employers need to be convincing, and so far they haven’t been; at the very least, there’s a long way to go before they write over outdated and longstanding perceptions about what it means to work in manufacturing. Until manufacturers start attracting job seekers new to the industry, they’re going to inevitably struggle to fill open roles. Employee referral technologies are relatively inexpensive to operate and result in consistently high performers. In fact, about one-third of companies say employee referrals are their top source of quality candidates. Manufacturers have long struggled to diversify their workforces. To give a sense of scale to the situation, men make up 53 percent of the overall workforce in the United States, yet they represent 71 percent of the manufacturing workforce. That workforce is also aging quickly. Large pockets of retirees are going to be difficult to replace without recruiting groups typically underrepresented on the manufacturing floor – including an increased focus on younger workers, women and minorities. Sourcing is key to improving diversity hires. Hiding names and photos on resumes is a great way to prevent bias if you’re already attracting a diverse candidate pool. If not, you’re not addressing the root of the problem. Manufacturing jobs are changing too. As automation increasingly becomes a part of manufacturing processes, employers require a different set of technical, in-demand skills. Employees with those skills may not look at manufacturers when considering the next step in their careers; it’s up to employers to make job seekers aware of this option and champion the industry as somewhere they should want to work. Read our 5 Manufacturing Insights: How to Grow and Maintain Your Workforce to learn how your team can face today’s hiring challenges.